2017 Quinta do Regueiro, Trajadura/Alvarinho, Minho, Portugal. 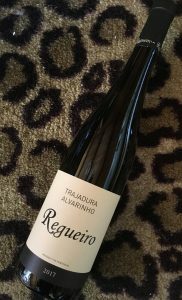 The beautifully mineral driven and zesty fresh Quinta do Regueiro Trajadura and Alvarinho from Portugal’s Minho DOC is a wonderful almost Riesling like white that offers a lot for the modest price. Regueiro, founded in 1988, is one of the best estate’s in the region and has some amazing old vine parcels, and is especially known for their single varietal Alvarinho/Albarino, the wines offer and step up in complexity and depth from the more basic Vinho Verde, while retaining the low alcohol and freshness you’d expect from this style of wine. This Trajadura led vintage adds an intriguing additional dimension which seemingly gives this wine a bit more substance as well as a slightly more expanded profile, it’s detail is certainly impressive and it’s acidity is vibrant though turns refined and almost rounded with air. The light/medium palate displays apricot, lime, green apple and honeydew melon as well as aromatic florals and delicate steely tones. While not as dense as the lees reserve Alvarinho, this wine for the price is an absolute steal, and it rivals much more expensive offers from it’s Spanish neighbors in the Ribeiro zone, it’s a beauty and goes great with fresh seafoods, especially clams, oysters and sardines. At under 12% this Trajadura and Alvarinho blend is perfect to drink with picnics and meant to be enjoyed in it’s youth, while Regueiro isn’t easy to find, it is worth searching out, drink up!